Indonesian Institute for Energy Economics (IIEE) served as a consultant to the Directorate of Energy Conservation, Ministry of Energy and Mineral Resources (MEMR) to estimate the effects of energy conservation policies, both existing and upcoming, using methods and monitoring tools agreed by stakeholders and to enable the directorate to have the results updated in the future. The project was funded by Danish International Development Agency (DANIDA) through Environmental Support Program 3 (ESP3) Program. The outputs of the study will be used by EBTKE as the basis for decision by political decision makers and to prepare the groundwork for better integration of energy conservation policies in future using the LEAP model. In general, this study proposed 3 scenarios for each policies i.e: (i) Business as Usual (BAU), (ii) Market Driven (MD), (iii) Policy Intervention (PI). BAU scenario represents the reference scenario of the National Energy Policy (Kebijakan Energy Nasional, KEN). In this scenario, average energy intensities are assumed to be constant as its value of the base year (2015). MD scenario assumes that improvement of energy intensity is only drive by the economic or market consideration. While, in PI scenario, beside natural market considerations, government of Indonesia (GOI) also implements a series of energy conservation policy to force the market to consume less energy to generate the same level productivity throughout the planning horizon. During the activity, IIEE actively involved and attended in a number of technical meetings, consultation meetings with the ministry, energy expert modeler and stakeholders to refine the energy efficiency model structure as well. 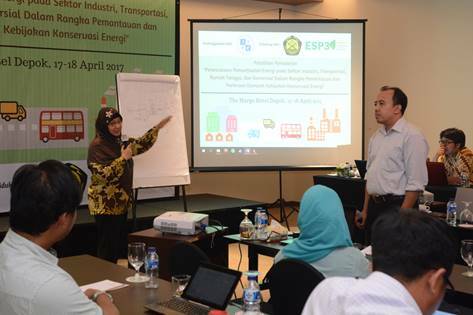 In addition, IIEE also performed Focus Group Discussion (FGD) in order to get the energy stakeholders’ views on the development of the model. Energy Conservation: Will Market Take Care of Itself?